Chalk Paint® Sample Pots…come here my little pretties! Chalk Paint® Sample Pots….GLORIOUS Sample Pots are now available for me to order here in the USA again! AND….I just ordered a TON! Seriously- I really did order a ton! If you have been waiting for them- I want to guarantee you – that the day we receive ours …is the day yours will ship out! And we ship orders Monday through Friday…almost always same day that you place your order too! And although you cannot see me- I just had to share that I am doing a happy dance! Available in all 31 delicious colors. A sample pot can cover between 14 and 17 square feet of surface. And actually if you thin it with a little with water ~ it will go even further! Do You Sell Your Painted Pieces? Always Add A Care Tag To Them! Do you sell painted furniture? Maybe you do this on Facebook or Craigslist…or even just word of mouth. EIther way- help people understand how to properly take care of the masterpiece you created for them. Especially since some people don’t just use furniture- they abuse furniture. Protect yourself with a detailed care tag! Many of you out there bought a quart a paint and a tin of wax~ just to do a piece for yourself, and then your friends saw it and…..BAM! You are in business! Well, congratulations! You are in business! Something very important – is to make sure if you are painting pieces- that the people who receive them know how to properly take care of them. This helps them and also helps you in the long run- since you would not want them using a product on it that could effect the wax or ruin the piece. So, please make sure to always attach a “care tag” & your business card to your painted pieces. Some people even add a notation on the receipt or paint contract that a “maintenance tag” was provided and have the customer initial it. First, no matter if selling your pieces on Craigslist, a co-op, or in a store ~ adding a care tag and your business card is a very professional courtesy to provide to your customers. First! Always include your business name and contact information! Sounds obvious, huh? Even if you have a business card attached to the piece- if gets lost- your customer may have no way of tracking you down to paint another piece for them. (so here is a tip- decoupage one on the bottom of the top drawer. When I say “bottom”…I mean – they literally need to pull the drawer all the way out of the cavity and flip it to see it.) Tell your customer about it and I guarantee – they will think that was cool and not forget it is there! Your newly finished painted piece needs about 10 to 21 days for the top coat to cure. Wax may only take about 8 days depending on where you are located. Please treat it with care and avoid excess handling during this time. To clean your painted & waxed piece, use a mild soap & water. Never use a degreaser soap that can effect the wax. On other top coats- still use a gentle cleaner. Method is a brand that is safe. Avoid all contact with furniture polish, sprays, excessive water, alcohol and anything acidic. Be cautious of using essential oils, diffusers or aerosol products like hair spray near your painted and waxed pieces. If this is a table or desk – use a blotter pad to avoid pressing into a finished piece when writing on top of it. And always use placemats or coasters to protect from hot dishes or cups or glasses that perspire due to heat or humidity. Do you use an Ultimate Wax Brush? Hopefully you said YES since I strongly recommend that you use one. 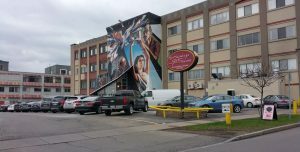 It will help insure that your wax application is applied correctly. CLICK HERE to watch my video on how to properly apply clear wax. Holding your wax brush properly when applying your wax can make a big difference in regards to how your hand will feel after waxing a dresser or – a whole set of kitchen cabinets. 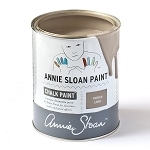 It will also make a difference in your experience using Annie Sloan’s products. 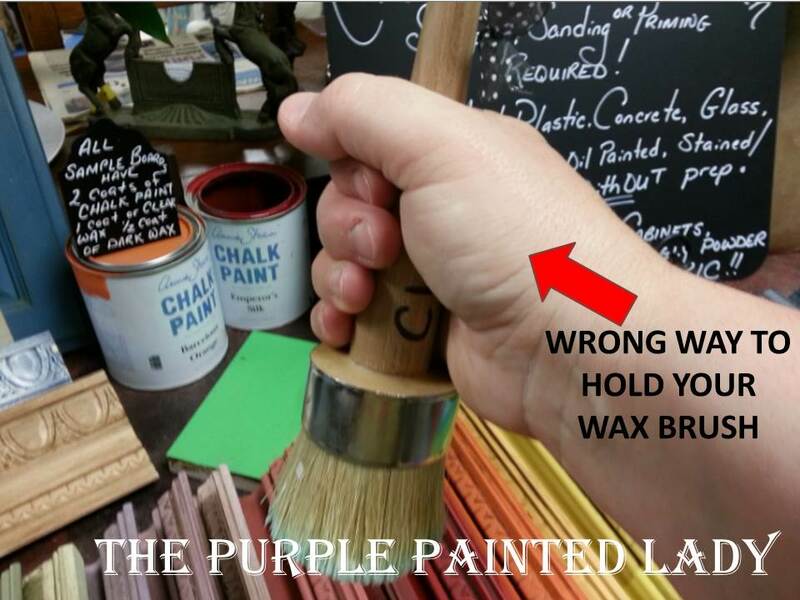 If you are gripping the handle of the wax brush too hard- it will strain the muscles and your hand will cramp up and feel sore afterward or the day after. If this happens to you- you should consider holding your Ultimate Wax Brush the way I suggest which will then make your waxing effortless and easy on your wrist. Again, I do NOT recommend holding your wax brush as shown above. When gripping and clenching- it causes strain on your muscles and will tire your hand. Ultimately, causing your hand to cramp. 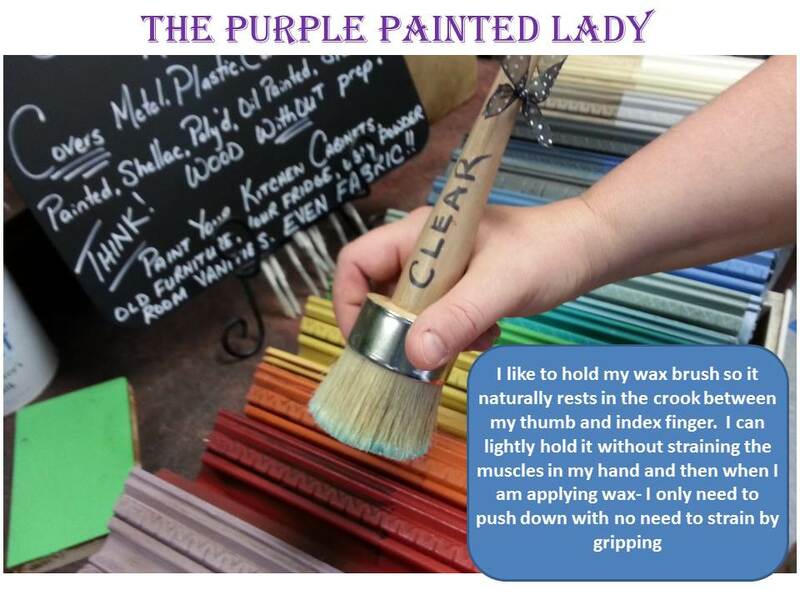 I suggest to hold your wax brush where the handle naturally rests in the crook between your thumb and index finger like I show in the photo BELOW. Slightly wrap or cup your fingers around the outer edge- and voila…. you are ready to wax & roll! Hope this quick tip helps you! I post weekly on Facebook ideas and suggestions. If you would like to be included, click HERE and then LIKE my page so you see my posts in your facebook updates. Smooth as Glass Waxed Finish- try this! 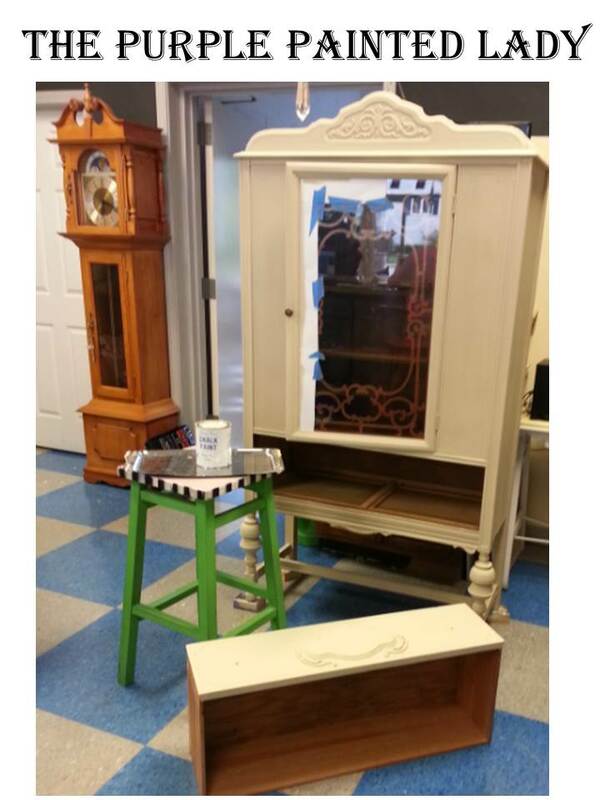 Want your pieces painted with Chalk Paint® and CLEAR Waxed to feel smooth as glass? Try our Steel Wool Grade 000 (link to our on-line store is noted below.) Pads are packaged and sold in poly sleeves, each sleeve contains 16 pads. Cost is $5.95 for the whole sleeve. This is a great deal and these will last you a long time. 1. After you have applied your clear wax and removed the residual from your whole piece- go back and use one steel wool Grade 000 pad. 2. I recommend using the steel wool once you have finished waxing the whole piece- because if you are applying the wax correctly- your piece should be totally dry. 3. Now take one steel wool pad and gently wipe your piece in the same direction as the grain of your brush strokes – from edge to edge. Do this just for a few swipes and then stop and feel. I like to glide the top of my hand over it to gauge how smooth it now is. Do you like the touch of it? 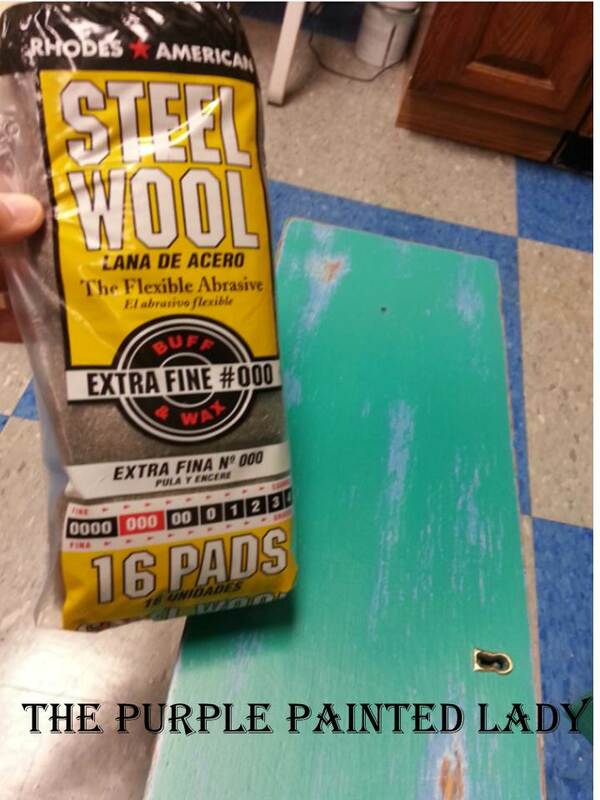 Just an FYI – one steel wool pad will easily do a whole dresser. But save the pad and use it for your next project that is of the same Chalk Paint® color. This grade of steel wool will polish your clear wax and you will be in awe of the finish your painted and clear waxed piece now has. * Have you noticed in all my instructions, I keep stating CLEAR wax? That is because if you try this on Dark Wax and it has not cured- depending on the amount applied- you can start to lift some of the dark wax. Again- practice or start on the back first. * Don’t scrub in a circular motion. I like to wipe the steel wool pads in the direction (or the grain) of my brush strokes. Rhodes American Steel Wool is the choice of professionals and do-it-yourselfers for wood finishing projects, as well as for cleaning, polishing and refinishing. There are 16 pads per poly sleeve. Cost is $5.95 for the whole sleeve. In the picture showcasing the steel wool above … you see a drawer that I painted. 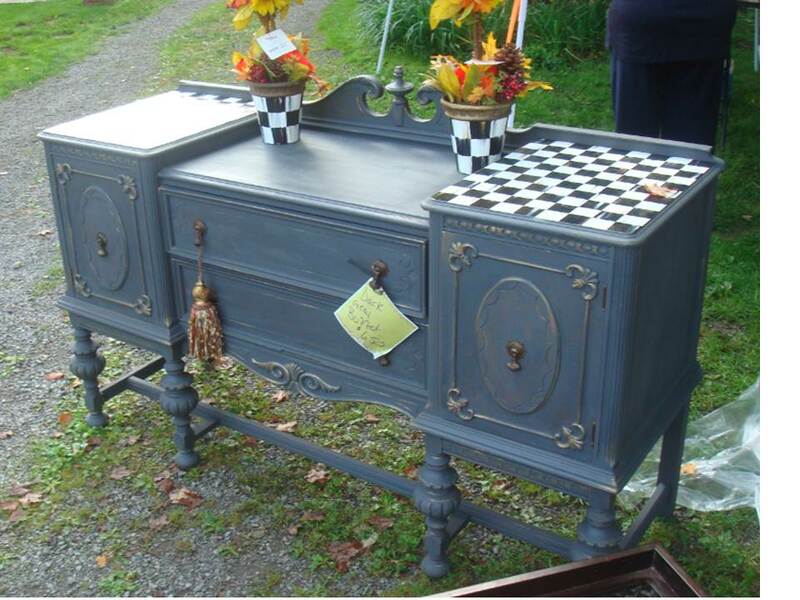 I first painted the dresser with Louis Blue, then Greek Blue, finished with a coat of Florence Chalk Paint® decorative paint by Annie Sloan. One coat of each color. Then I next used sandpaper (I think some 180 grit) and sanded back the edges and corners to give it a worn, aged effect. Some pieces evolve, so I then waxed the dresser thinking I was done – BUT I WASN’T. I realized I wanted some of the base wood to show through. Since I already had 3 solid coats of Chalk Paint® and had waxed the dresser a few days ago, I took a pad of sandpaper with an aggressive grit of only 80 and sanded the flat surface aggressively in the areas to reveal more of the colors beneath and the wood base. In the areas I wanted the wood of the piece to show- so you and where I used the aggressive grit sandpaper- you can see how I revealed that. Lastly, I applied my clear wax exactly as I demo in my VIDEO HERE. Once I had the clear wax completed- (which means it does not feel tacky and my fingers can glide across the surface) – I then lightly polished the drawer with some of the Grade 000 steel wool. You will immediately feel a difference. The wax finish will be like glass! How much does a Quart of Chalk Paint® cover? 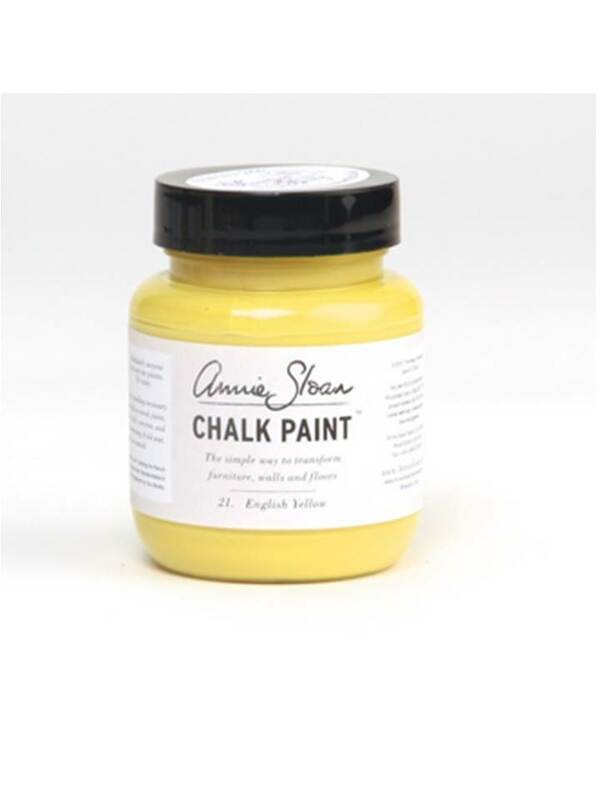 How far can Chalk Paint® decorative paint by Annie Sloan go? 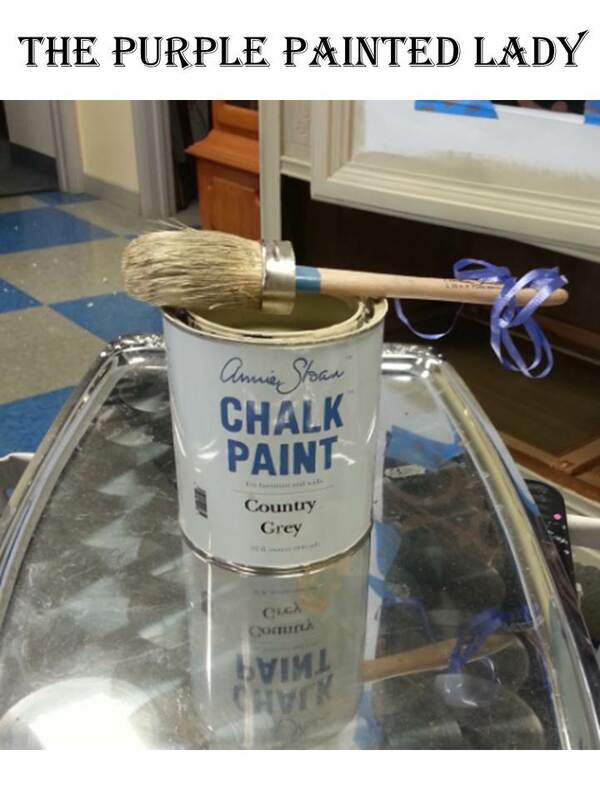 Generically speaking- a quart of Chalk Paint® will cover 150 square feet. Did you know that is almost twice the amount a quart of Latex covers. 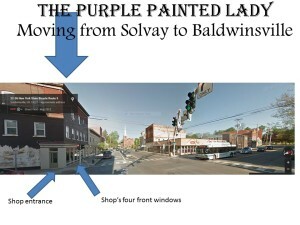 Now depending on the style of your painting, you may even get more surface coverage out of quart. And then on the other hand, you could get less if you are thick painter. To put this more into perspective versus giving abstract numbers. Today I started to paint a vintage hutch. The hutch is 37” wide and 68” tall. I painted 2 coats of Country Grey on it. (I did not paint the inside- since I plan on painting that in Old White. I still plan on accenting the hutch with Old Ochre also to highlight the details. And then, clear wax and a little dark wax too. 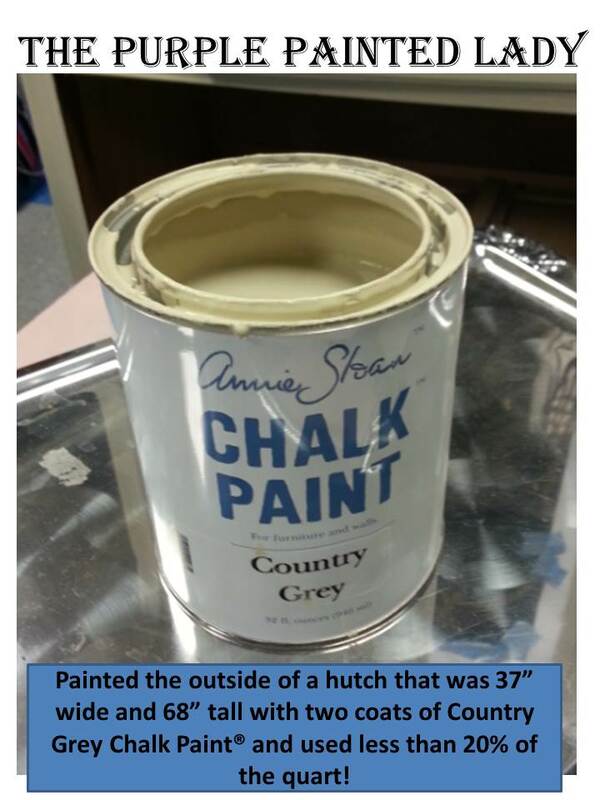 I opened a brand new quart of Country Grey for this project- and used an inch of the paint to complete the two coats on the hutch. I would estimate this was about 20% of the quart. 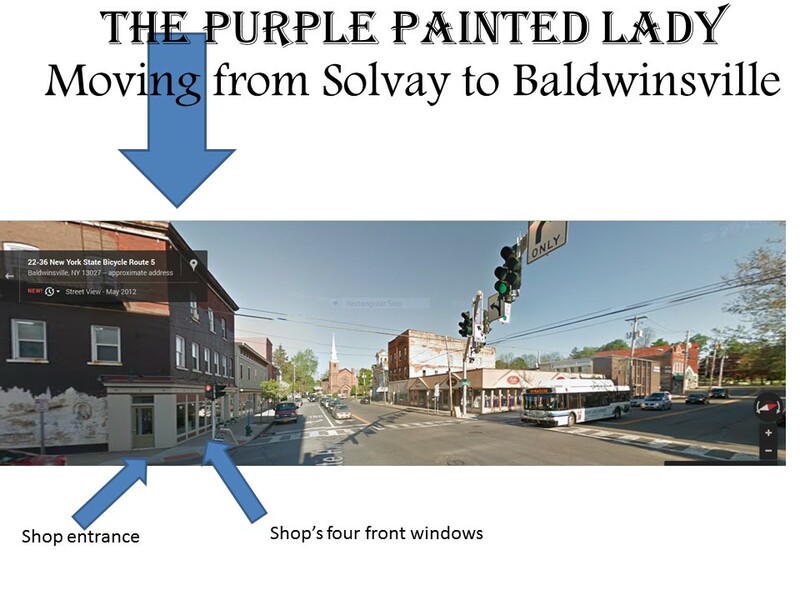 In comparison- a quart of Chalk Paint® will cover double the amount compared to a quart of latex paint. I used my Annie Sloan Medium Paint Brush. 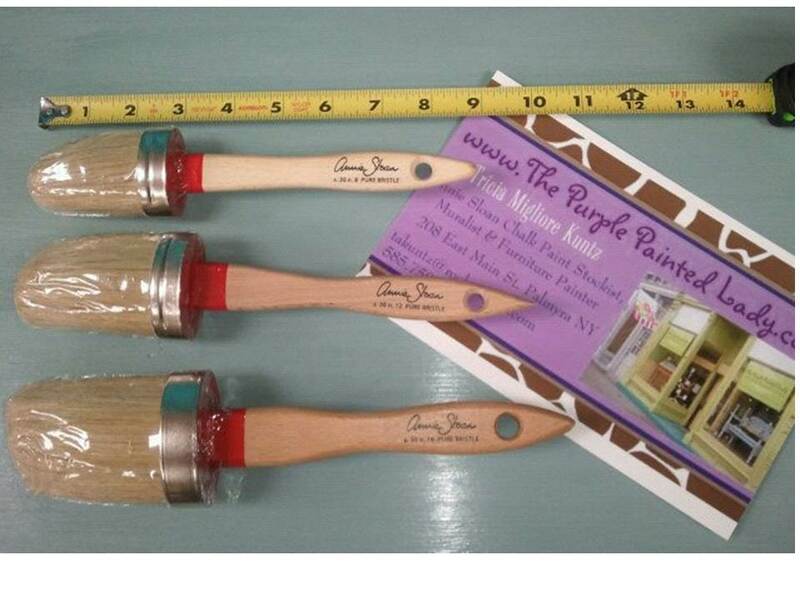 If you have never used a paint brush by Annie Sloan- you are truly missing out. As I like to share- the brush works like a ball point pen, in that it holds the paint and releases it smoothly. You will quickly realize, that you are spending less time dipping your brush in the quart, and more time painting. Annie’s brushes come in three sizes: Small, Medium and Large. 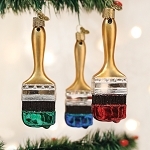 I feel a bit like Goldie Locks here- but for me, the medium paint brush, is just right! The small paint brush is great for small projects, and the large paint brush would be perfect for a wall project or when you have a large surface area to paint. If you are ever debating on purchasing a tool and would like to speak with me on if it fits your needs, or to know if it is a necessity or if it is a luxury- just give us a call or shoot us an email! We are here to help you!